This makes a lovely effect for your first dance and fantastic photo opportunity, A memory to keep for ever. 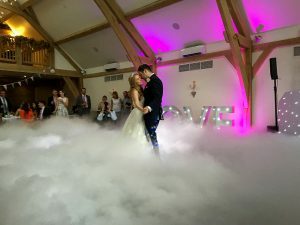 Lots of wedding venue’s have banned smoke and haze machine but dry ice is different as it does not set off smoke alarms as it is frozen Co2 which as it warms disperses into the air. 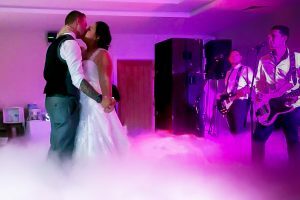 Our Dry Ice Machine is available for hire for weddings, parties, corporate events, in fact anywhere where a low lying fog is required. The dry ice effect on one fill usually lasts for around 5 minutes and takes approximately 1 hour to get to temperature. We can supply this on its own or as part of one of our Wedding packages. 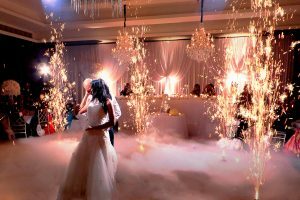 For that extra special effect, the dry ice can be lit by using our range of wedding up-lighting. By adding Up-lighting to the dry ice and nice subtle colour effect is obtained. Enquire for more details.